Home USA What is glioblastoma? Unlike other brain tumors that start in the body and spread to the brain, glioblastoma starts in the brain or spinal cord. The tumor arises from star-shaped brain cells known as"astrocytes." The American Brain Tumor Association labels the tumor "highly malignant" and cancerous because of its ability to invade and stay within normal brain tissue.The senator underwent surgery to remove a blood clot in July 2017 at the Mayo Clinic in Phoenix. Lab results from the surgery confirmed the presence of glioblastoma. 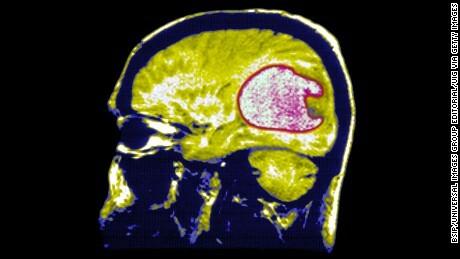 Glioblastoma is the most common of all malignant brain tumors, representing 15.4% of all primary brain tumors, according to the brain tumor group, which estimates that there will be over 12,000 cases before the end of 2017.This form of tumor killed Sen. Ted Kennedy and Beau Biden, the son of former Vice President Joe Biden. CNN Chief Medical Correspondent Dr. Sanjay Gupta spoke in 2017 to doctors involved in McCain's care with permission from his family. Gupta told CNN's Anderson Cooper he learned McCain had felt tired over the months before his diagnosis and had a bout of double vision but blamed it on his intense travel schedule. Doctors ordered a CAT scan and an MRI scan of McCain's brain that revealed the tumor. The symptoms of glioblastoma are usually a result of increased pressure on the brain.The American Brain Tumor Association lists headaches, nausea, vomiting and drowsiness as symptoms for the tumor. Depending on where the tumor is, however, weakness on one side of the body, memory and speech difficulties and visual changes can all be developed as a result. There is no specific treatment used for glioblastoma, but there are a few approaches doctors can take, Gupta said. "This is a malignant cancer. What that means in this case is that you operate on this," he said. "It needs to be treated as well with chemotherapy and radiation. "When a cancer is malignant, this means cells are dividing uncontrollably and can invade nearby tissues. They may also spread to other parts of the body through the blood stream or lymph system.The brain tumor association labels the prognosis for glioblastoma survival in terms of median survival, the length of time at which an equal number of patients do better and an equal number of patients do worse. Depending on the type of glioblastoma and treatment used, this can range from 14 months to three years. The association also cites a 2009 study that found 10% of patients with glioblastoma may live five years or longer.The average survival time for malignant glioblastoma is around 14 months with treatment, Gupta said. Josh Groban and Sara Bareilles, who co-hosted the awards show, kicked things off with a piano duet i..
Donald Trump has cancelled the planned summit with Kim Jong Un "based on the tremendous anger and op..